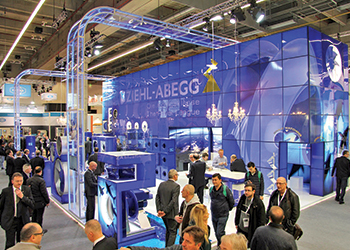 Ziehl-Abegg’s stand at ISH 2017. Its bionic profile has proven very effective in terms of efficiency – which can be boosted by up to 15 per cent – and low noise. Engineers at Ziehl-Abegg have clearly underlined their position at the forefront of bionics and as leaders in fan technology, says Peter Fenkl, chairman of the board of Ziehl-Abegg. The development engineers studied the physical structure and characteristics of the humpback whale in order to transfer elements to the new radial impeller. Evolution has optimised the whale’s body for movement through the water so it can undertake journeys covering several thousand kilometres with a minimal expenditure of energy, they point out. Explaining the elements of the humpback whale that have been replicated in the ZAbluefin, Fenkl says the leading edge of the fan blade has an undulating profile – this is modelled on the golf-ball sized bumps (technical term: tubercle) on the whale’s fins. He adds this avoids excessive turbulence, reducing both flow losses and noise. The flow engineers have also taken a close look at the whale’s rear fin, the “fluke”. The V-shaped contour of the rear section of the wing delays potential flow breaks, enabling the fan to be used for numerous different pressure ranges. The latest generation of radial fans at Ziehl-Abegg in sizes from 710 mm, is now benefiting from this knowledge which has been gained in the field of bionics. 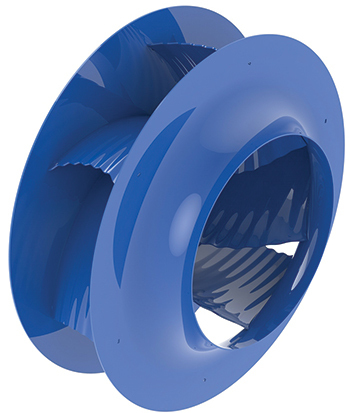 The ZABluefin radial impeller ... up to 15 per cent more efficient. But that’s not all. In addition to possessing bionic features of the whale, the new radial impeller also incorporates bionic elements of the owl. For example, the trailing edges of the ventilator blades recreate the flight of an owl. “As the quietest bird of prey, we have already used the owl as a model for a number of designs,” says Fenkl. Ziehl-Abegg showcased the ZAbluefin at this year’s ISH, a leading trade fair for the bathroom, building, energy, air-conditioning technology and renewable energies sectors, held in Frankfurt, Germany. A short film on the subject of whale-watching was integrated into the large trade fair stand. Ziehl-Abegg is a leading global company in the field of ventilation and drive technology and associated control systems, employing 2,000 personnel in its production plants. The Germany-based company has a global workforce of 3,550 spread between 16 production plants, 27 companies and 97 sales locations. Its product range, approximately 30,000 in all, are sold in more than 100 countries. The company turnover in 2016 totalled €484 million ($543 million), with exports accounting for three quarters of the figure.